There is one thing about Morning Musume and AKB48 that I have just found I truly appreciate; the graduations within these groups are expected, so as a fan, you kind of mentally prepare yourself for these graduations even if you don't want them, because in these groups it is a written rule; at some point, a member will graduate, and a new one will replace them soon after. So when it comes to other groups that don't have this system, or never had this system from the beginning, it is shocking when it happens. ... Just like it shocked me when I found out that Ishihara Kaori and Ogura Yui had announced their graduation from StylipS. I Reading this announcement, I think I went into a state of shock; I was probably being mellow-dramatic about it, but at 5am in the morning, there is not much you can do when you want to scream - so I resorted to crying and rocking back and forth for a few minutes as I talked to Nia on facebook about it, though I doubt I made much progress in trying to construct a decent sentence. Even now, about 45 minutes after reading the news, I am still in a state of shock over it. Disbelief too, but mostly shock and sadness. I mean, really... this is completely unexpected. Why? Why why why is this happening? A few hours ago I was thinking I was so incredibly happy, and wondering what could happen to make me sad and ruin that happiness. Well, considering I just damn well jinxed myself, I am now completely sad, because YuiKaori are graduating StylipS... so of course I fear for YuiKaori as a duo itself, too. YuiKaori are, to me, an awesome duo; I love them, and I don't want them to disappear... ever. If I knew that eventually they would leave I think I would be perfectly fine with this development, but because both YuiKaori and StylipS seemed to be stable line-ups, I never prepared myself for a 'graduation' like I did with Morning Musume and AKB48, so knowing that these two are now leaving, especially so suddenly, is extremely saddening and shocking to the system in a way. I feel so put out, like my heart has literally been torn out because they are leaving. This reminds me of when Saki suddenly left S/mileage. Much like the new member announcements, it was sudden and unexpected, and many people did not react well to it. This is, to me, Ogawa Saki graduating all over again. It's unexpected, and it certainly is not welcome (for me). Of course I can't do anything about it, it's their choice to leave, but still... with a group like StylipS, and one like S/mileage before the newbs joined, you kind of expect to see the same faces until the group eventually disbands. Sadly this obviously isn't the case, not that I want StylipS to disband anyway, but because YuiKaori are leaving, two girls who are a BIG part of Style Cube because of their activity in voice acting and singing, and are the two most recognisable members because of that activity and their past with Hello! Project. Okay, so Noto Arisa also has a good fanbase, but YuiKaori are, from what I know, the most recognisable because of their promotion and anime work. Of course, considering their popularity, I don't think (or at least I hope) that YuiKaori will leave Style Cube, and especially not their duo unit together, because they certainly are popular and very hard working, and I think that right now Style Cube still needs them because they are still building their company. So, the reason why they are leaving? Both Yui and Kaori have busy schedules and work loads, so they are leaving StylipS to focus on that. From what I know, Kaori is a University student, whilst Yui is probably in her last year of high school, and considering the fact that they both have a lot of seiyuu work... that could be a reason to leave StylipS. Hopefully it is only StylipS they are leaving though, or I would once again be a wreck and so devastated. And, whilst I'm writing this post, I had better get this out there: When I saw the title on Tokyohive that 'two members of StylipS' were to graduate, I actually thought, and hoped, that it would be Noto Arisa and Matsunaga Maho. Yes, I like Maho, but when it comes to StylipS, I can only think that the two members who could fully carry the name around and still bring it popularity would be YuiKaori, so to hear that they were the ones graduating... well, I was speechless and shocked as I have already said, and even now I still kind of think that, however selfish that is, but it's true; I really think that StylipS is carried by YuiKaori... though mostly Yui. I'm still shocked, and I still want to cry. Why wouldn't I? I love StylipS, and I love YuiKaori, and knowing that StylipS will go through the same change that S/mileage did leaves me feeling doubtful for their future. When S/mileage had four members, I loved them, and when they had new members, I embraced them only to be disappointed because their music was a shadow of their former selves, and seeing how StylipS is now, well... yes, I am scared. I think that they might go the same route as S/mileage did when they lost their two best singers, and one of the most recognisable faces. Much like YuiKaori are to StylipS. But I will still be scared for their future. I am still upset over this, but writing down my thoughts has greatly helped me with the news; I wanted to rage and cry, much like I did after finding out about the graduation, but being able to have a blog to write on has helped me greatly with the news. Really, after writing this much, I feel a lot better with myself and more at ease with the news, though still a little put out. But all I can do now as a fan and a 3rd party person is to wish YuiKaori luck, and to hope that they won't fade out or disband YuiKaori, and also to hope that the new girls who will be a part of StylipS will be just as wonderful as these two are. Right now though, all I can do is sit back and wait for more announcements to come out, and we will see where we go from there. THEY ARE RUINING MY DREAM TEAM. THIS IS S/MILEAGE ALL OVER AGAIN. THIS GROUP WILL FOLLOW S/MILEAGE DOWN THE TOILET. I'm hoping that they're just graduating to focus on YuiKaori, though... I mean the fact that both of them are graduating, and StylipS was the only group they announced that they were graduating from, it just makes me think that logically they want to stay as YuiKaori. And YuiKaori's success has been on the upswing lately, so it would be incredibly sad to just disband them like that. Fro different forums that I went on, apparently both Yui and Kaori have become extremely popular for voice acting roles, and so their work load has doubled, so I think that they are indeed staying as YuiKaori because that duo is pretty popular within the Anime fandom. "YuiKaori is a Japanese voice acting and idol unit. The group was disbanded on June 30, 2017 in order to concentrate more on their individual works. Wikipedia"
When i saw the title on Tokyohive, i instantly thought that YuiKaori were the two graduating. I had the feeling they would leave the group. I was hoping that it was Noto Arisa due to the fact that i know her for leaving before things got good but as long as the girls continue in with their duo and the group find new members that will be an asset to the group, all should be fine. Keep positive, the girls never said that they were leaving the entertainment business like Saki and Yuuka did. 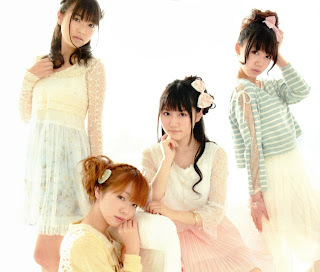 I hope the new girls are promising, and I will try to keep positive, but last time I was positive when two girls I liked left, the group became a group I no longer liked (S/mileage). But StylipS is a different agency, so hopefully they will do well after this.. I'm a bit late but its always nice to find fans of YuiKaori ^_^ Sorry to see that the graduation news hit you so bad. Honestly, I didn't expect StylipS to last more than one single ^^; This bunch of girls, I have followed them around, from when they were Team Dekaris, to when they formed Happy!Style and Yui and Kaori were just H!S rookies. So when YuiKaori left StylipS it didn't do anything to me since I tot they were still under Style Cube (formerly Happy!Style), or so we thought. I wanted to make this post to update you since you love YuiKaori so much. Recent development, Sept 16th to be exact, Yui and Kaori has left Style Cube to join Sigma7e. It will be their new agency starting from Sept 17. Yui and Kaori had announced it in their blogs and have stopped updating since then. YuiKaori as a unit is still going on as usual. 2ch says that Sigma7e, a subsidary of Sigma7 has connections to King Records, YuiKaori's music label. It is very likely that was the reason why YuiKaori graduated from StylipS. My theory is that King Records bought out YuiKaori from Style Cube, in order to have better control on this super duo's future development. I have to admit that Style Cube has limited resources to take make YuiKaori a bigger success. YuiKaori have that potential and I feel King Records/Sigma7 can make it happen. FYI, Nana Mizuki is signed to Sigma7. I was shocked too when I found out ^_^;; I just hope they would keep intouch with Nocchi and the others from Style Cube. They are like a family coz it all started there. That was the only thing I was sad about. Otherwise I'm happy for YuiKaori. Their future looks bright. It's fine! It's nice to know you wanted to comment! And I did eventually find out about what happened on JPlop actually, so it calmed me down, and I was happy to find out that they were still doing their activities despite this. I completely understand why they would leave, to; they are busy girls, and they are pretty much in demand from what I know, and if another company can give them a better chance of getting jobs... then so be it! I am seriously just glad that they are still voice acting and singing! And as you say, Style Cube are limited, but that is possibly because they are still quite new and have yet to establish themselves properly. To be honest, I'm not shocked by it... I studied Media so I kinda get why people do these things, and if these other agencies better the person(s) moving to that agency, then that is what is best for them! I am happy for YuiKori, they made a decision, and they are getting work through it, and becoming more prominent on the Anime/Voice acting scene! But yeah, I hope they keep in touch with everyone, too. They have been through a lot together, they really have. No, I didn't hear, I think! But I am so happy for her, it will be a great experience!